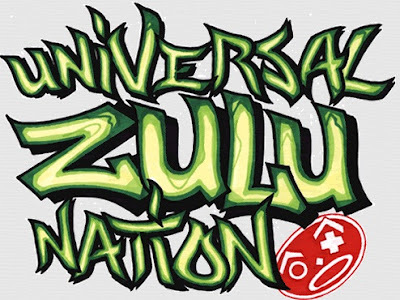 Despite Hurricane Sandy and Northeaster (Nor'Easter), the Universal Zulu Nation are celebrating 39 years of "Peace, Love and Having Fun!" Together forever the event also marks the 38th celebration of hip hop culture. Huge! UZN 39 FAMILY DAY EVENT: BUSHWICK BROOKLYN! There will be various M.C. performances, D.J. sets, graffiti art showcases, dancing, workshops, arts and crafts, food/drinks and more! FREE entry for all and open for all ages. Feat. Young Guru, Kool DJ Red Alert, GrandWizzard Theodore, DJ Tony Tone, El Da Sensei, King Russ, Samsunn and DJ Ayce International, Tone Trump, Peaceful Order of Warriors and more. MEETING OF THE MINDS @ the National Black Theater 2031 5th Ave Harlem between 125 & 126 St. NYC. Free to all but donations are most welcome! D.J.s Jazzy Jay, Johnny Juice, Rockin' Rob, Chuck City, Peril (Uzn Australia) Lady Love, Mel Starr, Chuck Chillout, Rich Medina plus performances by The Crash Crew, Son of Berzerk, Tricky T, Black U.N, Queen Bleu Nile, M-7 Rayvon and Johnny-Wa Boogie Boys, Sequence, Donald D, Quintescence, Santa, Zieme, Yungstar 6/3, MC Stik-E. Co-Hosts: GrandMaster Caz & Baron Ambrosia.